Picking the ideal wedding invitation is a lot like shopping for your wedding dress. It’s a process that requires looking at styles and mulling over different options before making the final decision. But while many brides have an image of the perfect wedding dress long before they start shopping, with invitations they often have no idea where to even begin. When they get to the stationery store, some couples may be overwhelmed by the variety of choices facing them. Other couples get so busy with all the other wedding details they let the invitations slip through the cracks. Some simple dos and don’ts will keep you on the right track. DO Think about the impression your invitation makes. Invitations are your guests’ first peek at your wedding so you want to make a good first impression. There are many design factors to consider when you start looking for invitations. Do you like contemporary or traditional? Do you prefer white, ivory, or color? What kind of budget do you have? Most couples benefit from investing some time researching invitation designs online or in magazines before hitting the stationery stores. You may find yourself gravitating toward a certain feature such as a graphic, font, or unique shape. Once you have some ideas of what you like, go to a stationery store to get personalized help. Selecting the type of paper is a good place to start. Consider the weight, size, and shape that appeal to you. The stationer will help you select the font, design elements, and even the wording. “Your invitation sets the tone for your wedding. If you know what style of wedding you are having, we can help you narrow your choices,” says Julie Redmond, owner of Vellum. Invitations may not be the first thing you send to your guests. Although most couples choose to send save-the-date cards, they aren’t necessary and don’t have to coordinate with your invitations. You may choose to do something more casual and fun, such as using an engagement photo. Knowing your budget before you start shopping will help keep you from getting your heart set on something that is outside your price range. The cost of invitations varies widely. For 100 invitations you can spend anywhere from $400 to $4,000 depending on the type of paper, number of pieces, and details such as foil stamping and printing technique. “When they are looking through samples we help guide them toward the types of invitations that fit their budget. Costs of invitations can run the gamut but there are options for cutting corners without losing quality,” says Ellen Gray, sales associate with the Service Bureau. Brides often underestimate the time involved with selecting, preparing, proofing, and printing invitations and other wedding pieces. Most stationers recommend starting the process about four to six months prior to the wedding. This will give you sufficient time to shop, order the invitations, have them printed, get them assembled, address them, and finally put them in the mail six to eight weeks prior to the ceremony. Gray says some couples ask about mailing invitations even earlier than eight weeks. aside the response card and end up misplacing it or forgetting to send it back. You can have your printed invitations ready to drop in the mail a month early, but don’t send them more than eight weeks in advance,” says Gray. Some brides unnecessarily delay ordering invitations until they are certain of the number of people they’ll be inviting. 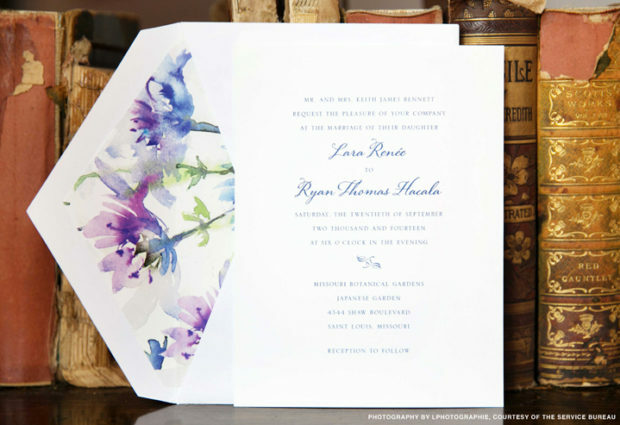 You can select your invitations and begin the ordering process without knowing the quantity. The final number for printing isn’t required until you sign off on the proof. Some invitations require assembly and all require addressing, stuffing, stamping and sealing. Make sure you allow enough time for all the work required to get the invitations in the mailbox. While you don’t need to know the quantity to get started, finalizing the number of invitations you need is crucial and can have a huge impact on the cost. It is much cheaper to add 25 invitations to your original order than it is to order 25 additional later. “If you order 25 more invitations after your original order, it will be treated as a new order. You won’t get the price break you would going from 125 invitations to 150,” says Redmond. Before you place your final order, consider the likelihood of the guest list changing. What are the chances you’ve forgotten someone or that a member of your family will want to add the list? Don’t pay for extra invitations just to have extra envelopes. Ordering additional envelopes is a good idea to account for any errors when addressing and can be added to your order separately. Redmond suggests that brides order an extra 10 percent. The number of pieces included in the invitation varies depending on the plan for your wedding and your personal preference. The possibilities include reception cards, response cards, and inner and outer envelopes. If your ceremony and reception are at the same location, you may be able to skip the reception card and include reception information on the invitations. If you need to include a lot of details, such as the time for the reception if it isn’t immediately following the ceremony or a reception location, you should consider a separate card. The response card is a must-have for every bride. The response set, a card and printed return envelope, are sold together as one piece. The response card should include a respond-by date. A typical response date is about a month out, but verify with your caterer or reception site how much notice they need for the guest count. Other information included on the response card is the guests’ names, number of people attending, and a meal selection if appropriate. Typically the response card is mailed back to the person giving the party. You will need to determine if the card comes back to you, your parent, or another appropriate person. Adding a stamp to the return envelope makes replying easier for your guests and may help increase the number of responses you receive. Traditionally, wedding invitations include an outer envelope for mailing and an inner envelope with just the name of the guest. The inner envelope is more elegant and typically has a liner. Unlike the mailing envelope, it stays crisp and clean and allows you to be very specific about whom you are inviting. Is the invitee welcome to bring a date? Are kids invited? More brides are choosing to forgo the inner envelope, often as a cost-cutting measure or to be more environmentally friendly. If you don’t use an inner envelope, you will need to address the outer envelope in more detail to clarify who is invited to the wedding. use of technology, brides now tend to refer guests to their wedding website for detailed information. Consider using a business-card-sized insert to provide website information or include the website on the invitation. Redmond says relying on a website to provide wedding information to guests is a great idea, but tells brides not to take it too far. “We don’t recommend using your website as a way to reply, for example. You have to be aware of your audience. A lot of older guests still aren’t computer savvy enough to RSVP through a website,” she says. During the invitation process, the company you order from will provide a proof, or sample mock-up of your invitation. This may be a PDF file that is sent by email. You may or may not be able to see color, but you will see layout, wording and type style. “The proof gives you one last chance to correct mistakes or make changes to your invitation. Have as many eyes on it as you can. Print it out. Read it out loud. Make sure that everything is perfect. Don’t hesitate to ask for multiple proofs. You want to make sure everything is correct before you go to print,” says Redmond. It used to be so simple. Traditionally, the bride’s parents paid for the wedding therefore the invitation read that they requested the honor of the guest’s presence at the marriage of their daughter. But times have changed. Sometimes both the bride’s parents and groom’s parents help pay for the wedding or the couple pays for their own wedding. Not to mention divorce, blended families, nontraditional families and other complicating factors. Don’t be afraid to ask for help. Stationery vendors deal with diverse situations and will be able to help guide you through the process. They will have examples of wording and are familiar with the etiquette. “There are so many different scenarios with family dynamics. We help couples with options for their situation. More often we are dealing with multiple sets of parents who may be contributing financially to the wedding and you want to recognize that,” says Gray. There are several acceptable ways, and one big faux pas, for addressing your wedding invitations. Many couples choose to hire a calligrapher for an elegant look. This will add significant cost to your invitations but will look beautiful. The Service Bureau has a list of reputable calligraphers to recommend and can provide a cost estimate. Many vendors, including Vellum, offer a service called computer calligraphy that is less expensive than hand calligraphy but still beautiful. You may use a font that matches your invitation or select a font that imitates traditional calligraphy. “Computer calligraphy is cost effective and time efficient and many couples like the look of matching the envelope with the invitation. Also, part of our addressing service is helping with etiquette. For example, most cities, streets, and states are not abbreviated on wedding invitations,” says Redmond. Computer labels, however, are unacceptable unless you have an invitation mailed in a unique vessel such as a tube or box. In that case, you should have the label designed to match the invitation. machine to preserve the look of the invitation. “Very few post offices will hand cancel. Also, there is a postal regulation that requires you to pay 22 cents per envelope in addition to postage for hand cancelling,” says Gray. Websites such as Zazzle allow couples to design customized wedding stamps. Gray says the custom postage is popular, but will add to your expenses. Before mailing the invitations, compile a sample and have it weighed at the post office to confirm the postage amount needed. You may even want to go to more than one post office to make sure you use the correct postage. Finally, wait to seal the envelopes until you are certain all the pieces have been included. From selecting your paper to dropping them in the mailbox, wedding invitations involve a process of picking, planning and preparing. But there are plenty of resources to help you navigate. While the Internet is a great place to get a feel for what you like, go to a stationery store to purchase your invitations. “I can’t tell you how many invitations we’ve redone for people who shopped online. It is going to pay off to work with a real person rather than a computer. When you come to our shop we will walk you through the process. You actually feel the product and see the colors. A picture may look beautiful online, but you don’t know what the quality will be like,” says Redmond. “One of the biggest challenges is convincing couples not to buy invitations from an online retailer. They think they are cutting corners but it ends up that the quality isn’t what they expected, errors are difficult to correct, and changes can’t be made because they aren’t working with a person. It ends up being a bigger hassle and adds time and expense to the invitations,” says Gray.